Today we went on one of our jaunts down to Evergreen Brickworks to take some family photos and let Buzz run around and have some fun. This is the first time we've gone down there with Bo with the intent to take a family photo. I think it turned out great and am planning on getting it printed to put up on our wall. The photos of the boys in the circles are actually them sitting in the windowsills of the cob house. The people at Evergreen Brickworks have been working on this cob house for quite a while and I think that it is finally done, it is definitely Buzz's favourite place to play. When planning an adventure around the greater Toronto area we are often on the lookout for great playgrounds. 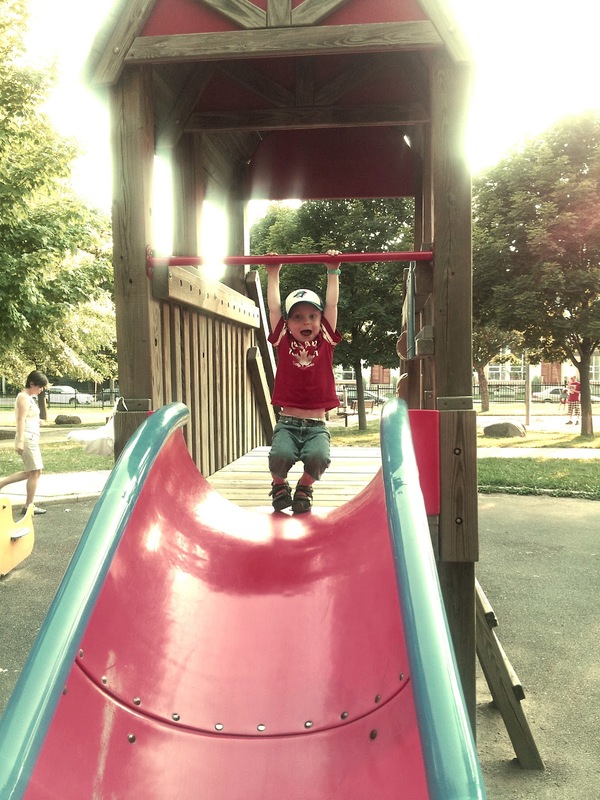 While any playground can be fun and enjoyable, there are definitely some factors that make them more or less fun for both Buzz and myself (Bo doesn't yet care). Being the type of person who plans our outings I usually like to hop on the internet the evening before and check out whats in a given area. I always look for peoples opinions on local playgrounds, I'm almost always disappointed with the amount of info that is out there. While you can sometimes find info on the parks in general, information on the playgrounds themselves are lacking and so I'm going to attempt to fill the void. The format of my playground reviews may change a little as we find things that we love or despise about various playgrounds, but I hope that I can at least give a little insight into the condition, amenities, and general awesomeness of playgrounds around the city. I will do my best to include some photos, although they will most likely be from my phone as opposed to to the camera. 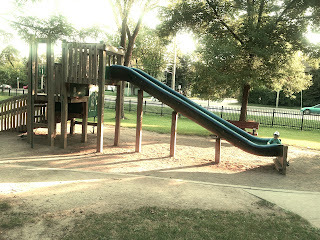 First up is our playground of choice for this evening : Bayview Village Park. Location : On the east side of Bayview Ave, north of Sheppard. 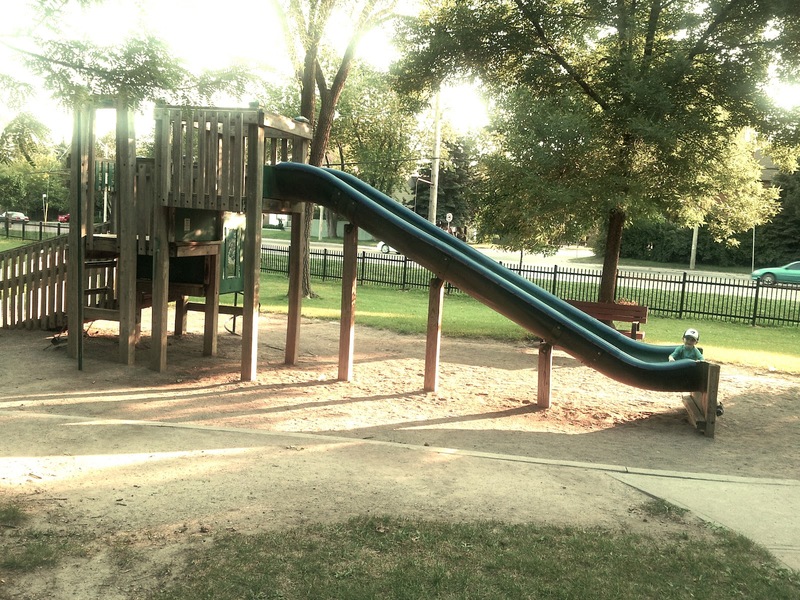 This park is within walking distance to the Bayview stop on the Sheppard Subway Line. If you are driving to the park there is a parking lot which has about 25 spaces.We've only been here a couple times, but both times we were able to get a parking spot without any problems. As this park is surrounded by a residential area I suspect a lot of people walk over. From a parents point of view I think the best thing about this park is that it has a fence separating it from Bayview Ave. Without the fence it would be unplayable as the playground equipment is located fairly close to the road. The fence runs all along the west side of the park and seems to generally contain the kids. There are three separate play structures with slides, they seem to be for toddlers, young kids, and older kids as they are three different sizes. I suspect that they have been there for a while as they are made of wood, not metal and plastic like is commonly seen in most playgrounds. They are all pretty simple structures, but the kids seem to enjoy them. The surface under the playgrounds are either covered in sand or soft rubber. The sand is not deep enough to play in and is closer to teeny pebbles in some areas. This park has a splash pad!! 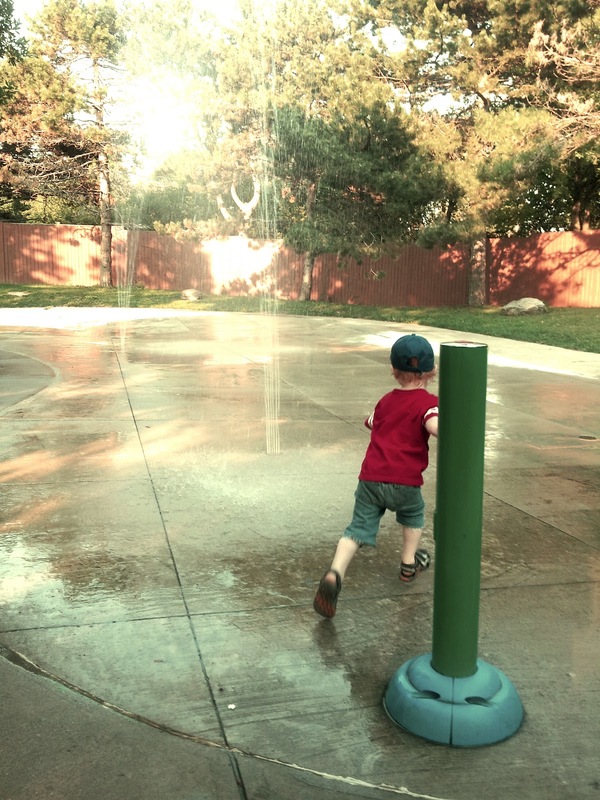 The sprinklers are in a concrete pad and the button to turn them on was difficult for the toddlers to activate, but all the kids running around seemed to the enjoy the water. The sprinklers are pretty basic, the only structure on the splash pad is a water tower, no water spouting animals or cat tails here. We were here around dinnertime and the splash pad was mostly shaded which was nice. The splash pad seems to be wheelchair accessible, however most of the playground is not all that wheelchair friendly. Unfortunately the age of this playground is starting to show, there is some minor graffiti on some things, the benches could use a coat of paint, and the water fountain was leaking terribly. Despite the age and basic play areas this park has a lot going for it. The fence allows parents with more then one kid to watch them comfortably. There are plenty of shady or sunny places for a picnic, playing with a ball, or general running around. There are a decent amount of places to sit and even washrooms (albeit port-a-johns not large enough to fit a stroller). This is a park that we will probably return to as it is near some shops that we frequent. I think that when it was first built the park would have been great, shiny and new is always better than tired and old. It could use some updating and a little maintenance, although I didn't see any trash around, the play areas seemed dusty and a little dirty. Above all else this park is pretty average, it has some really good things going for it, but it is also fairly boring looking. Sometimes boring is great for kids, it develops their imaginations, however sometimes its just plain boring. This park leans a little more towards just plain boring. -3 play structures with slides. -2 other structures with monkey bars and rings to swing from. 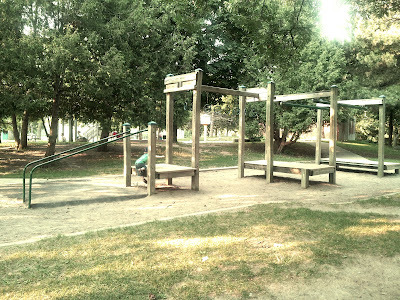 -5 picnic benches and 4 park benches within the playground area. More benches can be found on the outskirts of the big fields. -1 accessible swing with asphalt leading up to it. -1 drinking fountain (not working well when we were there).